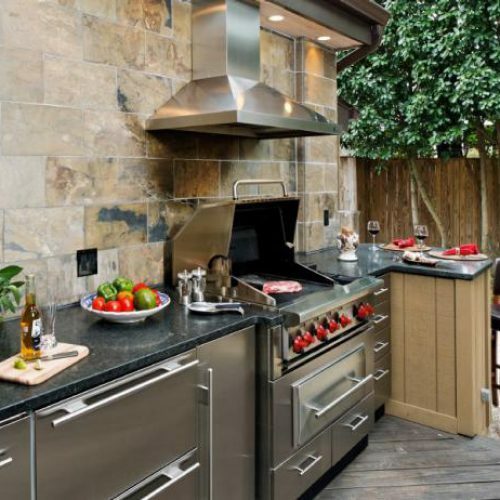 Here, Outdoor Kitchen Appliances Repair Specialists serving the Greater Houston Area. Before long, we’ll get your Barbecue Gas Grill, Rotisserie equipment, Built-in Refrigerator, and under-counter ice Maker working. For example, we fix Wolf, Viking, Thermador, Dacor, Avanti, Broilmaster, Broil King and much more. In the first place, do you have an outdoor Kitchen Appliances Repair needs? Here, Appliance Home Services can be of immediate support. We service and fix all types of outdoor kitchen appliance in the Greater Houston metro. So, if you have a BBQ grill, Grill, Gas Burners that needs repairing call us today. Generally Speaking, we all know that one of the joys of having an advantage of outdoor space is being able to cook on a built-in Griddle or gas grill. Because of the Houstonian Humidified heat, your outdoor appliance requires more often servicing. For the most part, Appliance home services have a long history fixing and maintaining outdoor kitchen and backyard appliances. We regard ourselves being a Top Notch BBQ and outdoor gas grills and built-in under counter Appliance Repair Company. So, Contact us today at (281) 888-4477, and we can schedule an appointment to visit your home and service your backyard kitchen appliances. As has been noted, an integrated barbecue grill adds tremendous value to patio area settings. Additionally, it makes the yard or more of a social place — one where friends and families could gather and entertain. In essence, everybody appreciates a BBQ Grill beside! They have integrated barbecue grills. Furthermore, they come in all sizes and shapes. Usually, the much less elaborate ones will indeed require no upkeep in any way.